As an avid fashion magazine reader, Krista follows the latest trends and knows the colours of the season. Makeup is designed with the model in mind, tailor-made according to the latest fashion as well as the shape, skin tone and eyes of the model. Studio shoots also require different makeup due to the strong lighting used, which could drown the models face. We cater both for photographers who wish to create a great look for their models, and for models asked to join shoots and want that flawless look. Outrageous, never-seen-before catwalk trends are also available. If you want to look great, and feel pampered on your engagement or wedding day, contact us to arrange a personal trial. We ensure a custom-made package to suit your skin tone, skin type, and personal style. Whether it's a natural glow, or smokey finish that you're after, we guarantee a happily ever after. Whenever you want to look and feel great, get your makeup done. Be it a party, launch event, TV show or wedding, we can discuss the colours and styles you like best and create a tailor-made package to suit you. As an actress, singer and drama teacher, Krista understands the dynamics of the theatre well. After reading the script, consulting with the director, and watching a rehearsal or two, we are confident that we could come up with highly effective designs for any genre or character. 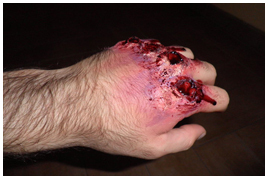 Knowledge of special effects makeup also allows for prosthetics to be used and 3D effects to be created, according to the nature of the performance. On the other hand, we are also aware of the requirements when working in intimate theatre spaces and the detail necessary in such cases. Give the appearance of length and thickness without mascara and enhance natural beauty with permanent eyelash extensions. These are synthetic hairs individually attached to the natural eye lash. If cared for properly, these last for the life-time of your natural hair and can be worn indefinitely, with infills every several weeks. They are perfect for special occasions as well as day-to-day wear. Why have amazing lashes only for a special occasion when you can have them every day? What’s more, this procedure does not result in clumpy, over-exaggerated false lashes, but elegant, naturally-full lashes instead! Read more on the eyelash extensions page. Women who have sparse eyebrows, for whatever reason, have used many cosmetic products over the years to fill in their eyebrow area, be it pencil, wax or tattooing. There was no available option for gaining realistic texture, contour, and feel to the eyebrow area... UNTIL NOW! This new technique involves carefully gluing individual synthetic hairs onto existing fine hairs or directly onto the skin in order to fill in gaps, add volume and extend the brow line. It is therefore also ideal for people with no brows/hair at all. Read more on the eyebrow extensions page. The use of prosthetics, blood, and a few other tricks of the trade, come together to create highly effective, realistic wounds. Krista can create any type of wound such as open wounds, scars, cuts, stab wounds, bullet holes, bruises, black eyes, nose bleeds, scabs and so on. Special effects makeup, however, does not only take the form of casualty simulation but also ageing, 3D facial features, and facial hair. Facial hair is also custom designed and built from scratch. It is often the case that ready-made prosthetics are not exactly what you are looking for, perhaps in size or shape. We can provide custom-made prosthetics to suit the clients’ needs. These can be in the form of scars, open wounds, noses, chins and so on. Having custom-made latex prosthetic is crucial for continuity on camera for instance, as the same prosthetic may be reused several times. Furthermore, once the prosthetic has withered, a new one could be created from the original mould! The set of any performance is the backdrop to the action of the play, which captures the audience’s attention from beginning to end and contributes a great deal to the action happening on stage. Having designed various types of sets, from box sets to backdrops and cut outs, Krista’s art background allows for comprehensive design and execution. Her theatre experience allows for attention to functionality, relevance to the script and detail. A model’s look doesn’t stop at the face alone. We can help in creating a top to toe look, particularly for themed shoots, or shoots requiring costumes. Basic hair styling is also on offer. Based in Malta, Krista is a makeup artist specialising in all types of makeup: fantasy, catwalk, stage makeup, makeup for TV and photography, special effects, casualty simulation and beauty makeup.